Unanimous 2015 NL Rookie of the Year Kris Bryant of the Chicago Cubs got quite a workout in the bottom of the 12th inning against the Brewers Wednesday night as manager Joe Maddon shuttled him around the diamond. Wood got Hernan Perez to fly out, after which Bryant and Javier Baez, who entered the game in the ninth to pinch run, actually swapped gloves as Bryant went to first and Baez to third. I presume Maddon wanted Bryant at first, feeling that Aaron Hill was more likely to slap it that way and felt Bryant could make a more accurate and stronger throw to the plate to prevent the winning run. In any event, Hill popped out to short. Two outs. "We got out of that inning and it was huge, just icing on the cake," Bryant said. The Cubs won the game in the 13th thanks to another unusual play: the Brewers intentionally walked Miguel Montero to load the bases for the previous inning’s hero, Travis Wood, who drew an RBI walk. The Cubs (28-10) went on to win the game 2-1. "It would’ve been cool if I had gotten the ball at each position," Bryant said of the whirlwind 12th. "I enjoyed it. I’ll remember this game for a very long time." 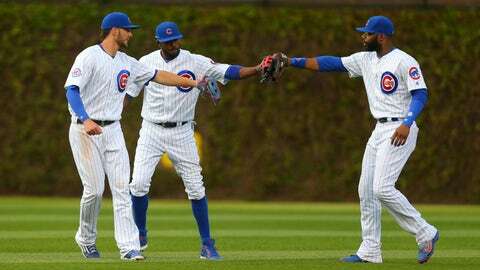 Chicago Cubs left fielder Kris Bryant (left) and center fielder Dexter Fowler (center) and right fielder Jason Heyward (right). Don’t get greedy, Bryant. You’re playing Little League-style in the Big Leagues for the best team in baseball right now.